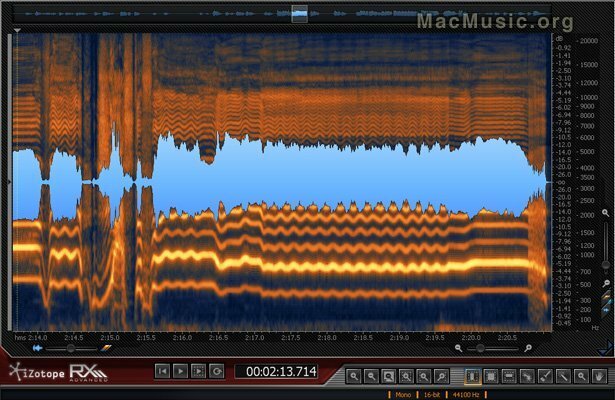 IZotope has released RX 2 and RX 2 Advanced, updates to their audio repair software suites. With a range of new features and functionality, iZotope has expanded the scope of RX into any field where audio is recorded or restored by both consumers and professionals. Additionally, iZotope is offering introductory pricing on RX 2 and RX 2 Advanced purchases and upgrades throughout October 31, 2010. RX 2 and RX 2 Advanced are designed to repair common and uncommon audio problems like tonal and broadband noise, hiss, buzz, hum, clicks and crackle, distortion from clipping and interfering sounds like cell phone rings, dogs barking, car horns, string squeaks, dropped drumsticks and just about anything else. RX 2 builds on the success of the original's Denoise, Spectral Repair, Declick, Declip and Remove Hum modules with iZotope's latest DSP algorithm improvements and the new Decrackle and Channel Operations modules. RX 2 Advanced extends the standard RX with an adaptive Denoiser mode, a Deconstruct module, third party plug-in hosting, iZotope 64-bit SRC resampling, MBIT+ dither, iZotope Radius® time and pitch control, ability to export an edit history, multi-resolution mode for Spectral Repair and automatic azimuth correction. RX 2 and RX 2 Advanced include new visual editing features and functionality such as the Magic Wand, Lasso and Brush tools designed for selecting audio in the product's spectrogram. Similar to working in popular graphic design programs, these tools allow natural freehand selections around problem sounds. The Magic Wand can automatically select a sound and even automatically select its harmonics. After selecting, Spectral Repair resynthesizes audio allowing the user to seamlessly remove unwanted sounds or even fill in gaps in the recording. RX 2 and RX 2 Advanced further improve the workflow from the first release. Like the original, they are available as both a suite of plug-ins for a DAW and as a dedicated application. An extensive edit history tracks every change the user makes allowing unlimited undo and compare processing. RX 2 Advanced adds the ability to export the history to an XML file for archival or forensic documentation. The application also saves complete session information, so the user can restart the application and continue working with even the audio selection and undo history being remembered. The updated Batch Processor allows the chaining together of modules to operate on multiple files, all optimized with the use of multiple CPUs. RX 2 and RX 2 Advanced are ideal for restoration engineers, video post production engineers, forensic specialists, audio engineers, recording musicians, broadcasters, podcasters, archivists, videographers and anyone who records audio.